When a Dino PC system is configured and purchased, a welcome manual is included in the package. This serves as a guide for getting the system up and running with a brief layout of all connections, switches, and ports, along with advice for setting up Windows and maintaining the usability of the PC. This guide is now available to read below, for those would prefer to read it online. Thank you for purchasing a system from Dino PC. Whether you’re an avid gamer, casual user, or a creative professional, we welcome you into the Dino PC family. This instruction manual will serve as a guide to the layout and operation of your new system. Before you fire up the PC we recommend that you read through this guide to make sure you set things up, to make sure that you have received everything you have ordered, as well as how to maintain and prolong the life of your new PC. The back of the PC tower is where all the cables will plug in This includes power, display, peripherals, internet, etc. 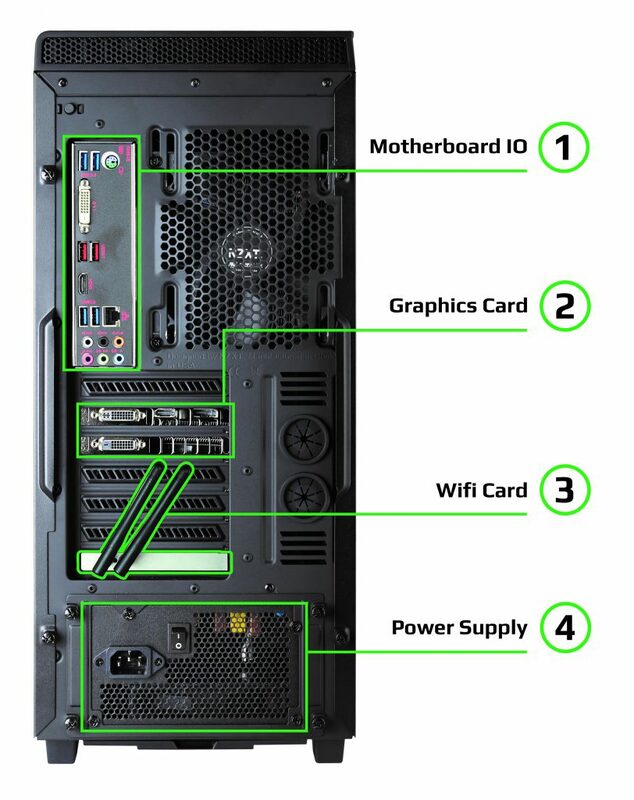 Below is an image of the rear of a PC, which may not be identical to yours but should be relatively similar. Please Note: In some rare instances, you will notice a USB cable hanging out of the back of the case. This should be connected an available USB port. PS2 Port: Used for older keyboards and mice. 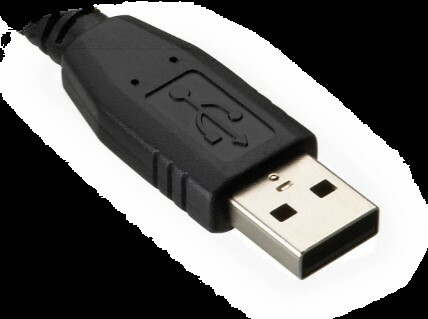 USB 2.0/3.0: Used for connecting mice, keyboards, webcams, speakers and headphones. 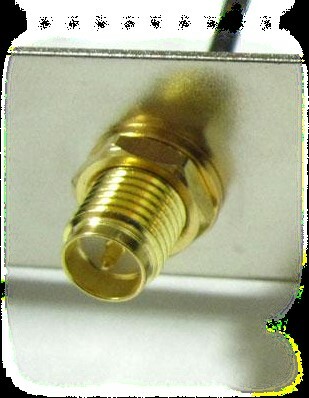 DVI: The DVI port is used for connecting to a standard monitor. 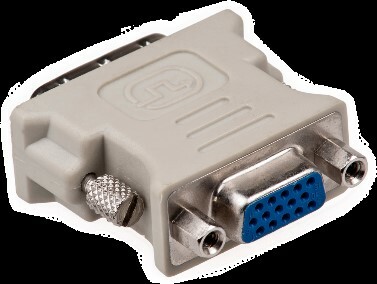 VGA / D-Sub: This port is used for connecting your system to older monitors. HDMI: HDMI the preferred connection when using a TV or HDMI enabled monitors. 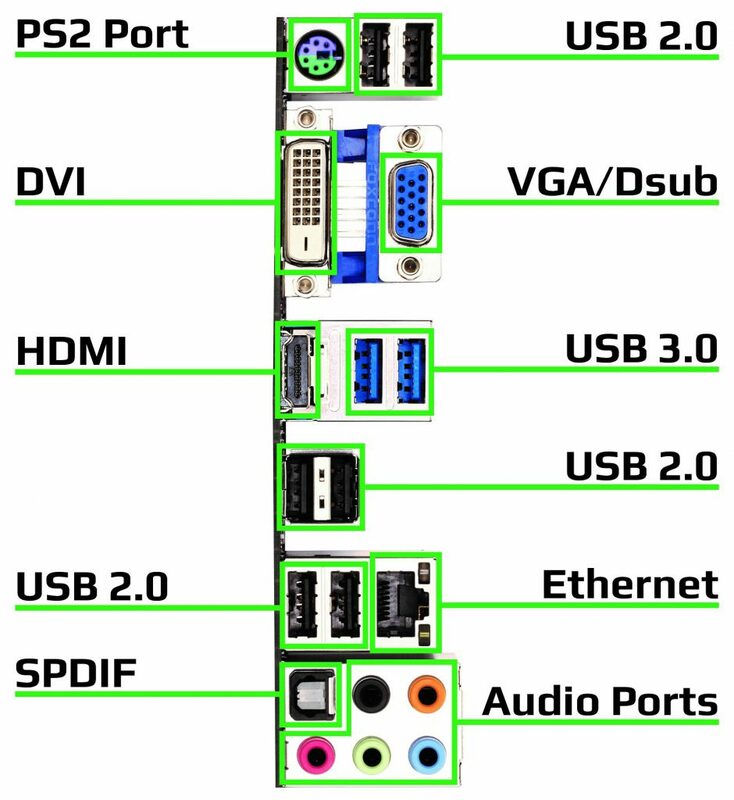 DisplayPort: DisplayPort connectors are featured on modern graphics cards for 4K viewing. 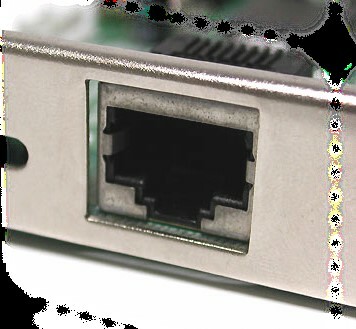 Ethernet: You can use this port to enable a wired internet connection (LAN). 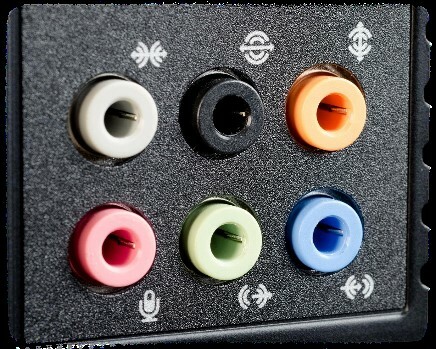 Audio ports: Generally, you would use green for speakers, and pink for a microphone. Remaining ports including SPDIF should be used for surround sound audio configurations. Power Supply: The PSU port is required to provide mains electricity in order to power the system. This should be switched to the On position once all connections are in place. Please Note: If you have selected a dedicated graphics card you should always plug your display cable directly into this, otherwise your monitor may show a “No Signal” message and not display anything. Thunderbolt: Used for connecting devices such as certain displays and high-performance data devices. This looks quite similar to a USB port. 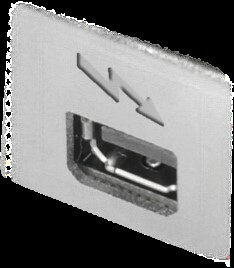 Firewire: Used for connecting peripherals such as external hard drives, and some digital camcorders. Internal wi-Fi: If you have selected an internal wi-fi card all you will see are the exposed connections without an antenna. You should be able to find the necessary antennas in the welcome box that came with your system. Simply screw the antennas in place. Now we are familiar with the back of the PC we can begin connecting peripherals. IMPORTANT: Please make sure that there is no power cable connected to the PC or monitor at this stage. If your mouse and keyboard have USB connections like these, then you just need to plug each into a USB port at the back of the PC or at the front. It is advised that you check whether these devices require either USB 2.0 or USB 3.0 and use the correct port at the rear of the PC. If your mouse or keyboard has PS2 connectors then you just need to connect them to the PS2 port on the motherboard rear IO (usually towards the top). These are generally keyed so please make sure they are being connected correctly as they are easy to damage. If your motherboard does not have a PS2 connection, please use a USB adapter. Windows should automatically detect both keyboard and mouse and install the necessary drivers, however sometimes you will need to install software from the manufacturer’s website, or included CD to gain particular functionality such as RGB Control. Be aware that PS2 devices need to be connected before powering on the PC, unlike USB peripherals. The Monitor is connected via a range of options, either VGA, DVI, HDMI or Display port. 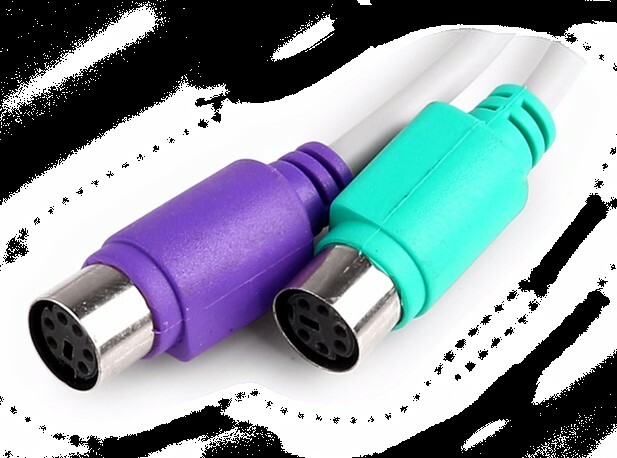 If you have a monitor that uses a connection type that is not compatible with the ports on the graphics card, then you will require an adapter, which looks like this. These can be ordered via our website. There will be an Ethernet Jack (aka. LAN Port) on the rear of the PC, alongside the other motherboard connections. Simply plug this in to your router, and to the back of the PC. The connection should be ready to go, and you should be able to access the internet straight away. If you are using a wireless connection you will have selected a Wi-Fi card during the configuration of your system, or one will have been included as standard on some of our systems (states on your order details / invoice). With a wireless signal as long as you have screwed in the necessary antennas, you should be able to select and connect to you wireless network. If you are planning on using one of these simply plug it in to an available USB port. Windows should automatically install drivers, and software, however in some cases it will be necessary to do this yourself, with the included CD, or by downloading drivers and software from the manufacturer’s website. For speakers, it is generally best to have these plugged in to the rear of the computer, freeing up the front audio jacks for headphones when required. The green jack is normally used for audio output, such as speakers or headphones, for a microphone you will need the pink jack. Please Note: If you have connected two audio devices at the front and rear at the same time, they might not work together. You can select which device you need to work at a given time by heading to the playback devices section of settings within Windows. At Dino PC we only select high quality components, brands we have worked with and know we can trust to deliver a PC that upholds our reputation for quality, performance and reliability. All our PCs are assembled in our London offices by our highly skilled and trained technicians. Once a technician has built your system he’ll hand it over to our quality control department to run extensive tests and “burn in” your PC for around 24 hours to make sure it’s performing up to standards. There might be anti-static bubble wrap inside the case as an additional precaution to ensure large components are secured. This needs to be removed before the machine is powered up. The packaging and padding material is required if the system needs to be returned to us, please fold it and store it away. Once you are happy that all your devices have been connected, the last stage is connecting the power cable. Included in your welcome pack is a power cable or “kettle lead” which should be plugged into the slot at the rear of your PC. When inserting the cable, please make sure the power switch is in the “0” position to avoid sparks. Once the power cable is in you can click the power switch to the “I” position. Congratulations, everything is plugged in. All that is needed is to press the power button on the front of the PC to fire it up. If you notice a peripheral or monitor is not working then check back through and make sure you have performed all of these steps correctly (in some instances using a different USB or Display port can instantly sort out connection issues so it is also worth a try). If you are still having trouble, we have a handy FAQs section at the end of this manual for some basic troubleshooting. To activate Windows you will need to enter your activation code which can be found on the sticker on the side of the PC tower. When you first turn on your computer, you will be prompted to activate Windows. Choose a Theme colour, one you like which will be prominent across Windows. You can add a wallpaper, change the lock screen etc. to suit your needs. To get through the activation process quicker, you can click on express settings. If you want to go through these options in detail you can click on Customize. You will need to assign your system a name, and password. This will be used to secure your computer, and you will need these details to login so please remember them. • Dust build-up can cause your fans to work at a higher operation than normal, creating more noise and less airflow inside the PC case. This can be solved by giving the fan intakes of your PC a clean. You can remove the side panel of the PC and remove any visible dust build up making sure to be gentle when doing so. Alternatively, you can also use a can of compressed air, to clean out dust build-ups. Please be careful and ensure that the power switch is in the “0” position and the power cable is unplugged whenever you open the side panel of the computer. Please also observe anti-static precautions by grounding yourself by touching the PC case or any metal surface before handling PC components. • Make sure your follow the correct shut down procedure. If you turn off the PC using the power button instead of through Windows it can cause premature failure of the HDD and cause problems with Operating System registry. • Use the “Disk Cleanup” utility built-in to Windows to remove temporary files that can be wiped off to clean up your system. This can be found in the Start menu > Accessories > Disk Cleanup. • After using your system for a while it can become bloated and sluggish. To avoid or minimize this situation it is highly recommended to retain at least 10GB of spare storage space on your HDD/SSD. At this point it is also a good idea to backup any important data. 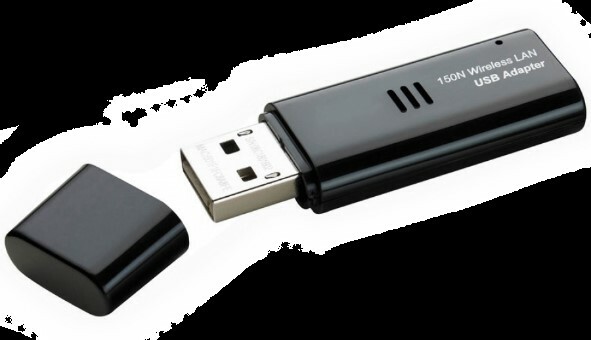 Backing up important data can be done using a USB drive or external HDD and using Backup located in Start menu Settings >Update and Security > Backup. • As PC technology moves on, you may be inclined to upgrade certain aspects of your system such as RAM, storage drives, and graphics cards. In these instances, upgrading components can have a massive impact on boosting performance and is a much better option than buying a whole new computer. You can contact us so we can review your specification and advise which components would be best to upgrade. We also recommend contacting us to notify us of upgrades, as some upgrades installed by yourself carry the risk of damage if installed incorrectly, which can void your warranty. Can I upgrade my PC without invalidating the warranty? We understand that our customers have a requirement to upgrade certain parts. Make sure that proper precautions are taken when carrying out any upgrades, and the parts used are compatible and of high quality. If a warranty claim is made for a PC that has been upgraded, and the fault can potentially be attributed to the upgraded part, then you might be responsible for labour and any other costs. How does your warranty work? As standard each of our computers are covered by a 5 year warranty, which means we wouldn’t make money out of providing support for your system and you can rest assured that we will be willing and ready to help put things right if any issue does spring up. Our systems are supported by our trained support staff on a return-to-base basis. If you live within close proximity to our, then you can bring your system for repair. If you are outside the carriage cover period this is available at £40 to arrange collection from your premises and ship out the repaired system. What happens if I have a problem with my PC? If you have a problem with the PC and require technical support you can contact us and we will do our best to resolve any issues reported as quickly as possible. We will reply with possible solutions, and if a hardware fault is confirmed by our technical support advisor we can proceed with collection process. If you feel you require more information than this guide can provide, you are welcome to contact us directly either by phone or by e-mail. Please ensure you have your order number to hand, or quote it in an e-mail as this will help speed up your enquiry. We hope that every customer has such a fantastic experience that they can rave about to us to their. We are constantly improving to deliver an exceptional level of quality, service, and value. Operating System: The primary system program that manages computer hardware and software, responsible for the visual interface and performance. Display / Monitor: An output device responsible for displaying visual information such as software, movies, data and games. Software: A set of instructions or tasks associated with an application, provided with partial or full control from the user. Hardware: The physical components of a computer responsible for functionality over software. Ethernet / LAN: A network protocol that controls and delivers information be it online or local, over a physical connection from one location to another. Wi-Fi: A wireless form of transmitting data and communication over a local area network, used in alternative to an ethernet connection. GPU / Graphics Card / Video Card: An expansion card (graphics processing unit) which provides dedicated processing to 2D and 3D applications such as image applications and games. CPU / Processor: The central processing unit responsible for executing commands and instructions from the software and applications. RAM / Memory: A form of temporary storage which stores data and code in use by an application for faster access and performance. HDD / Hard Disk Drive: A permanent storage device used for storing data, applications, documents, games and media, based on magnetic storage technology. SSD / Solid State Drive: A permanent storage device used for storing data, applications, documents, games and media, based on integrated circuits and flash memory technology. Optical Drive: A form of data storage used for permanent or temporary backup of data by the way of reading and writing to optical discs. Chassis / Case: The enclosure responsible for the installation of all internal computer components, as well as external connectivity. PSU / Power Supply: A PSU provides and converts mains AC power to the computer in order to power all components safely. Motherboard: The primary printed circuit board which allows inputs and connections to every other component inside the system. Cooler / Heatsink: Cooling equipment required to transfer the heat produced by computer components, in the form of copper fins, heat blocks, fans, and liquid-cooling technology. Keyboard :An input device responsible for control and accessibility over programs and software, where input from the user is required. Mouse: An input device responsible for navigations and control over software and applications. Rear I/O: External connections located towards the rear of the computer which provides access to the motherboard. Front I/O: Used for connecting external devices to the front of the computer. Drivers: Hardware-specific software responsible for functionality and optimal operation of components installed in the computer. Power Cable: Provides power from the mains outlet to the system PSU in order to give functionality to the system. Peripherals: External devices such as mouse, keyboard, headsets, webcams and wireless connectivity devices.